When you choose Chicago Blue Dolphins for your child, you’re choosing the most innovative children’s swimming program in Chicago. Conduct classes in our cutting-edge Swim Studio for faster, more precise learning. Incorporate a mix of smaller, Endless pools and full-size pools that build swimmer fitness and teach a full range of swimming and water safety skills. Use games, imagination and fun drill names like “Hot dog!” and “Superman arms” to keep learning fun yet effective. Apply technology, such as instant video playback, for faster learning. 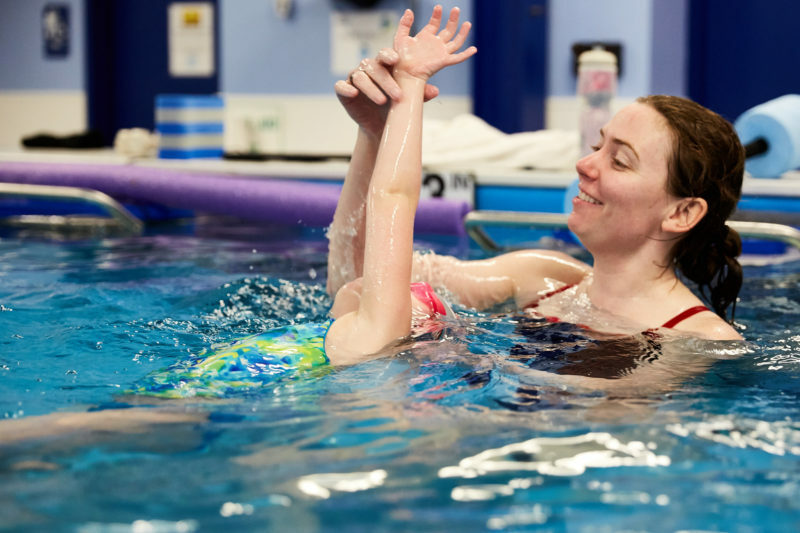 We’re extremely proud of the fact that our methods; our positive, patient and fun delivery; and our technology builds better swimmers because the children clearly understand what they’re supposed to do and how to do it. What Levels of Classes Do You Offer for Kids Ages 4 to 12? Becoming comfortable and relaxed in the water. Learning the basics of aquatic breathing (bubbling). Becoming self-sufficient with floating, gliding, kicking and doing elementary strokes on the front and back. Learning to float for longer times and with more control. Learning the basics of freestyle and backstroke, including body rotation, arm motion, and kicking. Rolling to get air without losing body position or momentum. Learning the basic body positions and leg action for breaststroke and butterfly. Building up to at least 30 strokes of freestyle with rhythmic breathing and better mastery of fundamental positions. Building up to at least 30 strokes of backstroke with good balance, over-water recovery, side-to-side rotation and timing. Learning the foundations of the breaststroke by adding the arm stroke and learning basic timing. Building up to at least 10 strokes of breaststroke with good pull-breathe-kick-glide timing. Completing at least 5 strokes of rhythmic butterfly with at least 1 breath. Once young swimmers graduate from Intermediate 2, they can join the Chicago Blue Dolphins Swim Team, where we continue to refine their swim strokes and also introduce key skills for racing, such as dives, turns and streamlining. What Can You Expect from Our Kids Learn-to-Swim Classes? In our custom-designed Swim Studio, your child will swim in a high-tech Endless Pool. Here’s why our Endless Pools will help your child learn faster and will make him/her a better swimmer overall. We keep the size of our classes small to give each child more attention and practice. Our student-to-teacher ratio in our kids swim classes is 4:1 maximum in our Preschool (Ages 4-5) classes and is 3:1 maximum in our School-Age (Ages 6 and Up) and Intermediate classes. The Beginner 1 & 2 – Pre-School Classes (Ages 4 and 5) run for 30 minutes, while all the other classes are 45 minutes each. Our classes run on a set 4-5 week session. Your child will focus on learning a particular set of skills during that period. At the end of the period, we will evaluate your child and either promote her to the next session or refine the current set for another session. We will send you and evaluation at the end of the session providing specifics on your child’s progress. Are Parents in the Pool with the Kids? In all of these classes, children are in the pool without a parent or caregiver. Most of our Beginners will be comfortable in the water, swimming on their fronts and backs, able to roll for air or call for help, and starting the process of learning the competitive strokes. Children at the intermediate level will make a major progress in learning the high-quality competitive strokes to enjoy on vacations or pool parties, to pass a camp swim test, or to prepare for a swim team. After the initial 3 session period, you will continue on a month-by-month basis. The monthly tuition for our Preschool, School Age, and Intermediate programs is provided in the table below. For parents who want to speed up the learning process, we offer a 7% discount on tuition for additional weekly classes you book. Yes we do! We also offer semi-private lessons if you’re able to recruit at least two other swimmers. Our private lessons last for 25 minutes for one to three students. If you purchase 5 lessons at once, you save 5 percent. Not sure if a group class or private lessons are better for your child? Contact our office to schedule a 25-Minute Skills Evaluation. Our instructor will run your kiddo through a series of exercises to determine her current skill level and then will give you an overview of the skills progression that best matches her skills and goals. Here’s the complete schedule for Kids Learn to Swim classes. Click the Filters “three line” icon to filter the results by day of the week, time of day class name, and instructor. If you see a SIGN UP button next to the class name, there is space available and you can register online. Please note that we only allow online registrations for the Level 1 classes. If you would like to register for a more advanced class, schedule a make-up, or put yourself on a waiting list for a class that’s full, please contact our office.